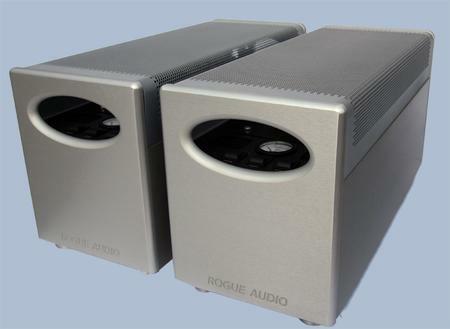 Elegant and refined, yet brutally powerful, Rogue Audio’s flagship monoblock amplifiers have raised the bar for reference level amplification. The Apollo’s ability to reveal the finest musical details while providing seemingly limitless dynamics are the hallmark of the finest amplifiers we have ever produced. Whether your passion is jazz, rock or symphonic works, these amplifiers will provide the clarity and dynamics to closely rival the original performance. That these pure tube amplifiers boast a continuous power output of over 250 watts is but a small part of the story. Designed and engineered without compromise, the Apollos boast ruler flat frequncy response, tremendous bandwidth, huge dynamic range, and vanishingly low levels of distortion. And the enormous LC power supplies enable the reproduction of musical transients at far beyond the amplifier’s rated output. With a unique and tasteful appearance, the Apollo chassis’ are constructed using CNC machined aluminum faceplates and body panels. The ultra-high tolerance electronics components and huge transformers contribute to the peerless build quality. Features include an on-the-fly switch offering either Triode or Ultralinear operation. A second standby switch allows the amplifier to remain warmed up and ready for immediate use between listening sessions. A built in meter and individual bias switches makes tube biasing a snap even for the tube novice. The rear panel contains balanced and single ended inputs as well as 4 and 8 ohm Cardas binding posts.